How fun is this shelving? It's the brainchild of Danny Kuo, who calls it Staircase. The most efficient way to build is vertically. Building vertically saves space as it uses minimal ground square meters. When it comes to interior design, the same rule can be applied. 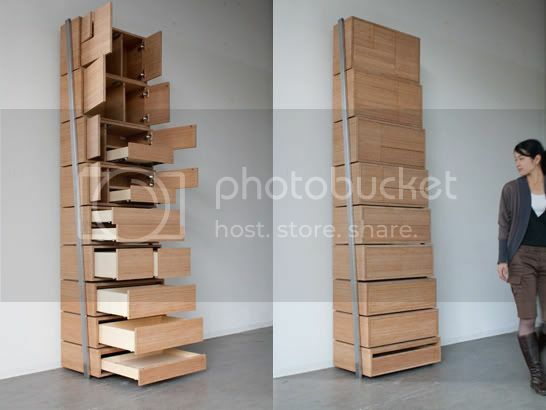 By focusing on height rather than width, efficient storage designs can be created. However, high storage designs can create a new problem because the higher storage parts will be difficult to reach. My Staircase is a shelving unit that combines a bookshelf with a pullout stair system in the bottom three shelves. The shelving unit is 2.6 meters high and the top shelves are accessible by using the bottom shelves as steps for accessing the higher shelves. More info and photos here. It's available — in white — for purchase from Opinion Ciatti here. This is pretty awesome. It makes me chuckle though, because I just moved into a basement suit with quite low ceilings, and had to cut down one of my bookcases to fit.